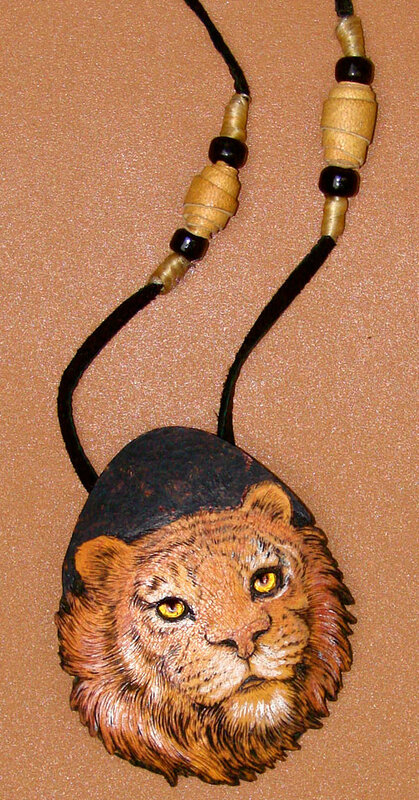 A tiger burned then painted on an oval section of gourd 2 3/4 inches wide and 3 1/2 inches tall was easier and faster to do simply because there was a lot less of it than the original which was done on basswood plate 12 inches wide. Also, because gourds are pretty unpredictable, I tend to make their patterns bold, simple and easy. I taught this a few years ago in Sarasota and was absolutely delighted with the beautiful quality of the necklaces (plus the fact that everyone finished by 5 o’clock). One of the things I try to do in every class, and will be sure to do in my new book, is to have two or more versions of a subject. 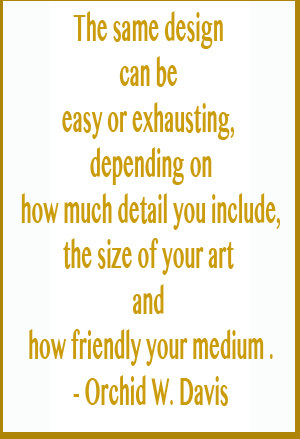 The same design can be easy or exhausting, depending on how much detail you include, the size of your art and how friendly the medium you’re working with. Wood is my personal favorite and not just because of it’s workability. I’m not perfect and one of the things I love most about wood is that after I’ve spent hours (or maybe days) on a piece if I slip up and make a little boo boo I don’t have to toss it out I CAN SAND IT OFF ! Gourds, plywood and leather are all used for pyrography with often beautiful results but if you make a mistake you’ll find these materials hold a grudge. When using them I advise trying anything new on a piece of scrap first. It’s no guarantee of success but at least you’ll have a better chance. This entry was posted in Gourd Pyrography, Pyrography, Woodburning Wildlife and tagged Craft, Gourd, Gourd Art, woodburned tiger on gourd by Orchid Davis. Bookmark the permalink.